The people of Mono inherit a magnificent natural legacy. The goal of the Town is to pass this inheritance on to the next and future generations, and to conserve and restore natural features and areas, as well as their ecological functions. Mono supports a great diversity of natural areas, species and ecosystems, all set within a diverse and scenic landscape of rolling hills, woodlands and wetlands, dry uplands and watered lowlands, cliffs and valleys, as well as other special places where Nature thrives. The provincial standard for mapping the areas to which natural heritage policies are applied is the Natural Heritage System. The natural heritage system is a network of lands and waters, of natural heritage features and areas, and of linkages intended to provide connectivity and to support natural processes that are necessary to maintain biological and geological diversity, natural functions, viable populations of indigenous species and ecosystems, which are considered significant for their environmental and social values as a legacy of the natural landscapes of the Town of Mono. Please self-identify your familiarity with and understanding of the Planning Process. Completing this section will help staff deliver comments on your proposal in the most effective way. Proposed Zoning: * Select oneNo ChangeConventionalSite SpecificMinor Variance If proposing a Conventional zoning change, what zone is proposed? If proposing a Site Specific zoning change or a Minor Variance, what relief is being sought? Town of Mono Official Plan designation(s): Does the proposal wholly conform to the policies of the Town of Mono Official Plan? If no, what changes are proposed? Name of Hamlet (if applicable) or specific area within Mono Does the proposal wholly conform to the policies of the applicable Hamlet and/or area? If no, what changes are proposed or being considered? Is the subject property located within or adjacent to the Greenbelt Plan? Is the subject property located within or adjacent to the Niagara Escarpment Plan? Is the subject property located within or adjacent to Oak Ridges Moraine Conservation Plan? Is any part of the subject property regulated by a Conservation Authority? If yes, which Conservation Authority? If yes, have you previously contacted the Conservation Authority? How is the existing property serviced? How is the proposed development intended to be serviced? Describe any natural features and/or functions, including hydrogeological on or adjacent to the subject property (i.e. water courses, valleylands, wetlands, woodlands, ANSI, Provincial Parks, Town-owned lands, Dufferin county forests, CA lands). Is subject property or buildings listed/designated on the Town's Heritage Register? Is an adjacent property or buildings lsited or designated on the Town's Heritage Register? Drawings are required for all pre-consultation applications. Can I construct/alter a pond on my property? All pond construction on properties in the Niagara Escarpment Plan area require a permit from the Niagara Escarpment Commission. 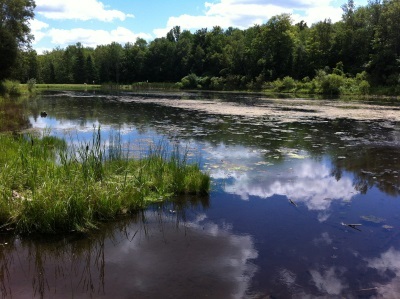 All properties in the Town are governed by a Conservation Authority and these individual Conservation Authorities may also require permits for pond construction. We receive many calls regarding ponds. so please ensure that you either have a permit from the appropriate agency or written response indicating that a permit is not required. What size of a garage/outbuilding can I build? All lots in the Town of Mono having an area of 1.21 hectares (3 acres) or less are permitted maximum accessory lot coverage of 140 m2 (1,500 sq ft), which includes all garages, attached or detached, and outbuildings. For lots greater than 3 acres, the lot coverage for all accessory buildings is 1% of the lot area to a maximum of 1500 m2 (16,146 ft2). Maximum height shall not be greater than 12 metres (40 feet). » For more information, please see Section 5(1) of Zoning Bylaw 78-1. Can I have a home based business in my residence? In Rural and Residential Zones in the Town of Mono, home occupations are permitted and must conform to the provisions set out below. If your property is located in the Niagara Escarpment Plan or Development Control area, home occupations are allowed; however, a permit is required from Niagara Escarpment and additional conditions may apply. Not more than 25% of the dwelling shall be used for the home occupation and it shall neither change the residential character of the dwelling, nor create or become a public nuisance, due to excessive dust, fumes, noise, vibration, traffic or parking. There shall be no goods, wares, or merchandise, other than arts and crafts produced on the premises, offered or exposed for sale or rent on the premises. No person, other than a member of the family, shall be employed in the home occupation or engaged in canvassing, delivering or as go-between in distributing merchandise to customers. Only private medical practice may include on employee who is not a member of the practitioner's family. No external display or advertising, other than a lawful sign of a maximum 0.56 m2 (6 sq ft), is permitted to indicate that any part of the home is being used for a purpose other than residential. » For more information, please see Section 5(9) of Zoning Bylaw 78-1. Can I have a second residence on my property? A secondary dwelling unit is permitted on lots that have a minimum lot area of 10 hectares (25 acres). Second dwellings are not permitted in the Niagara Escarpment Plan and Development Control Areas. A Secondary Dwelling Unit must be subordinate in size to the principal dwelling house; shall have a minimum gross floor area of 74 m2; shall have a maximum setback of 50 metres from the principal use; shall have a separate septic system; and shall utilize the existing driveway access. It is a strict policy in the Official Plan that secondary dwelling units shall not be severed from the property in the future. » For more information, please see Section 5(1)(i) of Zoning Bylaw 78-1. Do I need a building permit for a pool? All lots in the Town of Mono having an area of 0.81 hectares (2 acres) or less require a building permit from the County of Dufferin Department for the required fence enclosure. All fences for pools shall be constructed in accordance with Bylaw 2011-46. A Site Plan must be submitted to the Town, with the applicable Municipal Approval Form, detailing the pool fencing location and the type of fence to be constructed. Once the Municipal Approval has been approved by the town, a building permit may be applied for at the County of Dufferin. Please note that all construction vehicles must utilize the existing driveway. If this is not feasible, an Application for Entrance Permit may be applied for. Can I have an apartment in my house? In the Rural and all Residential zones in the Town of Mono, one accessory apartment shall be permittedin a residence on a lot. If your property is located in the Niagara Escarpment Plan or Development Control area, apartments are not permitted. The size of an accessory apartment shall be limited to a maximum of 30% of the gross floor area of a single detached dwelling house, excluding the basement and private garage. If an accessory apartment is located wholly in the basement, there is no maximum gross floor area. Apartments are only permitted in the dwelling house, and are not permitted in any accessory garages or other building on the property. » For more information, please see Section 5(1)(h) of Zoning Bylaw 78-1. Can I operate a dog kennel on my property? A maximum of 3 dogs are permitted on any property not licenced as a kennel. Licenced kennels are strictly controlled and are permitted on a property of at least 19.5 hectares (48 acres). Kennel licences must comply with Bylaw 2002-62, as amended. The Orangeville Branch of the OSPCA is responsible for reviewing and issuance of kennel licences in the Town. A Municipal Approval must be obtained from the Town of Mono prior to applying for a building permit. A site plan indicating the size and location of your proposal should be submitted with your application. A building permit is required for any new construction greater than 10 m2 (108 sq ft) in area. Please contact them to determine if a building permit is required. Can I keep or house horses/other animals on my property? Properties zoned Rural and that are greater than 1.62 hectares (4 acres) are permitted to keep animals. Property size will determine the number and type of animals permitted. Rural properties between 0.41 hectares (1 acre) and 1.62 hectares (4 acres) are permitted to have not more than 20 fowl or mature rabbits (plus litters). Any barns proposed to house five (5) or more animal units must receive a Nutrient Management Certificate from the Ministry of Agriculture, Food and Rural Affairs. »For more information, please see Section 20(4) of Zoning Bylaw 78-1 to determine the number and type of animals permitted on your property, and requirements for building barns on smaller lots. A Town of Mono Natural Heritage binder is located at the Town of Mono Town Hall front desk, containing the draft Natural Heritage Atlas mapping, policies and methods, for review and comment. Additional copies of binder materials may be requested at the front desk. All comments, additions or deletions would be gratefully appreciated. Please send by email to the Planning Department or leave written materials at the Town of Mono Municipal front desk. Thank you.